The Patriots have their first victory under their belt and the journey to Super Bowl 50 has officially begun. Before the game last night coast to coast celebrations featured Ellie Goulding and Train in San Francisco. Super Bowl 50 will be played at Levi's Stadium in Santa Clara, California, home of the San Francisco 49ers, on Sunday, February 7th, 2016. The Packers and Steelers are popular favorites for Super Bowl 50. AllYouBet Sportsbook offers competitive odds on all regular season games and has already taken a huge amount of bets on who will win the coveted Vince Lombardi trophy. When asked for their Super Bowl predictions, AllYouBet bookmakers say they like the Packers’ and Colts’ chances of making it to the Super Bowl this time around. It’s early days of course, but the Eagles, Seahawks and Ravens are also considered contenders. 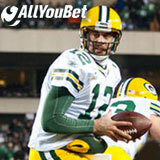 To kick off another season of American football, AllYouBet Sportsbook has a special bonus offer for NFL bets. AllYouBet American-style sportsbook’s $50 Monthly Free Bet for September is on US college football. Players that bet $500 at minimum odds of -200 / 1.5 on NCAA football will receive a $50 free bet October 1st.